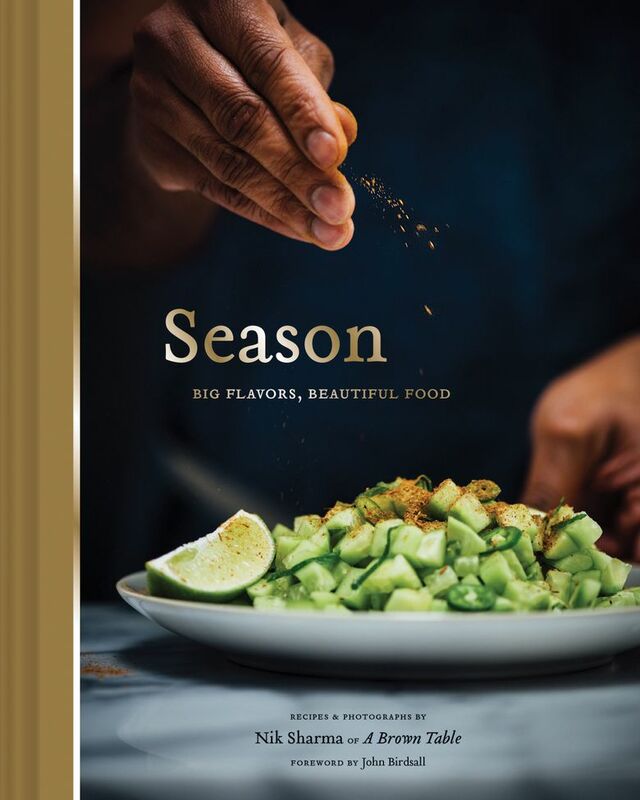 A conversation with the author of the newspaper column "A Brown Kitchen" and the new cookbook "Season: Big Flavors, Beautiful Food." And a recipe to try. 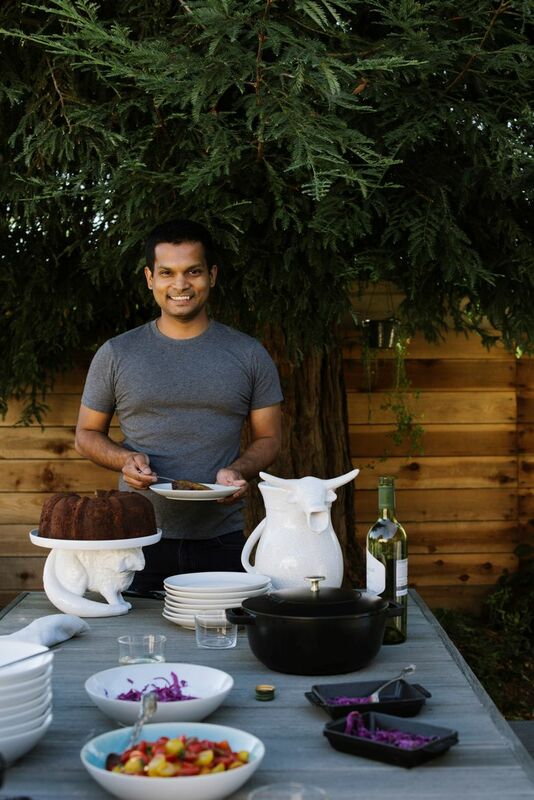 In the introduction to his gorgeous new cookbook, “Season: Big Flavors, Beautiful Food” (Chronicle Books), Nik Sharma writes, “Mine is the story of a gay immigrant, told through food.” His recipes, and the distinctive black-background photography that accompanies them, trace his journey from his native Mumbai to the United States for college in Cincinnati to his current life with his husband in California, where he writes the column “A Brown Kitchen” in the San Francisco Chronicle. What ingredients do you most want people to use more of in their cooking? Jaggery is one of my favorite sweeteners. It’s the most unrefined form of sugar that you can find in India. They take either palm juice or sugar-cane juice, and they boil it, I think typically in copper pots. And as the water evaporates, it gets concentrated, and you get this complex mass that’s not so sweet as regular refined sugar, and it also has complexity in taste, because it has minerals and salt. Tamarind is one of my favorite things to work with because it’s sweet and sour, and I really like those notes. When I was doing research for the book, I learned that tamarind is used very differently in Africa, where they grind the seeds and make a porridge. The leaves are also edible. Tamarind came to India from Africa many, many centuries ago. And ghee: You don’t have to spend $17 on a bottle of ghee from a certain store. You can buy, like, four sticks of butter for maybe four bucks and make ghee in less than 10 minutes. And it lasts forever. Your photography glorifies movement and process. Why do you want to make the process so beautiful, rather than utilitarian? From what I’ve seen in food media, there’s always an emphasis on the finished dish or the ingredients. But I love the process so much, and I always felt that I needed to pay homage to even the smallest things, like squeezing a lemon. Your photography also showcases your brown hands. You write that, when you were blogging, you got such negative feedback about that, you stopped for a while. What happened? I started getting comments from anonymous people who would say that my skin was too ashy or too dark. Not seeing representation and diversity in food media — in a weird way — I thought it was OK for them to tell me that. So I had to step back to kind of figure out what I really wanted to do. Either I should do this, or give up. What convinced you to keep at it? How do you see your work fitting into the larger conversation about representation and diversity? I don’t have a choice, right? Like, I can’t change my skin color. I can’t change my identity. And those are always going to be part and parcel of me. I want people to cook the food that I create and enjoy it. I hope that, in some way, people who read the book appreciate the fact that people who don’t look and sound like you are probably the people you should invite to your table, because that’s when you learn. 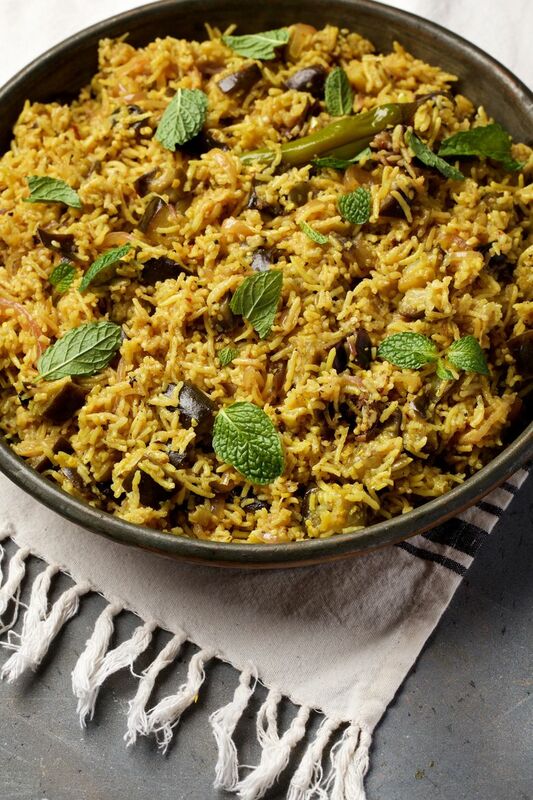 Serve this fragrant, one-pot meal with plain yogurt, a raita or lemon pickle. Make ahead: The rinsed rice needs to sit, covered, in a bowl of water for 1 hour before it is cooked. 1. Rinse the rice under cold running water in a fine-mesh sieve until the water no longer turns cloudy. Place the rice in a medium bowl, add enough water to cover (about 3 cups), and let it sit, covered, for about 1 hour. 2. Place the eggplant cubes in a large bowl and sprinkle with 1 teaspoon of the salt, then toss to coat. Cover the bowl with a lid or plastic wrap and let them sit for 20 minutes. Discard any liquid that is released. 3. Heat 1 tablespoon of the oil in a large, heavy-bottomed saucepan or Dutch oven over medium-high heat. Add half the eggplant cubes and cook for 4 to 5 minutes, stirring occasionally, until they are tender and lightly browned. Transfer to a large bowl; repeat with another tablespoon of oil and the remaining eggplant. Transfer to the same plate. 4. Heat the remaining 3 tablespoons and 1 teaspoon of oil in the same saucepan, over medium-high heat. Once the oil shimmers, add the onion and cook, stirring occasionally, for 10 to 12 minutes, until golden brown. Then add the black pepper, coriander, crushed red pepper flakes, turmeric, green and black cardamom pods, cloves and bay leaves; cook for 30 to 45 seconds, until fragrant. Stir in the garlic, serrano chilies and pumpkin seeds; cook for 30 seconds. 5. Drain the rice, then stir it in; cook for 2 to 3 minutes, until the rice grains are completely coated with the oil and are not sticking to each other. 6. Return the cooked eggplant to the pot. Stir in the 4 cups of water, the lime juice and the remaining 2 teaspoons of salt; increase the heat to high and bring to a rolling boil, then reduce the heat to medium-low, and cook for 15 minutes, uncovered, until most of the water has evaporated. 7. Add the peas, cover and cook for 4 to 5 minutes, until they are tender. Remove from the heat; keep covered and let the pilaf sit for 5 minutes. 8. Fluff the rice with a fork; re-cover to keep warm. You can remove and discard the whole spices and serrano chilies, if desired. Garnish with the fresh mint before serving.